The parish church of St Lawrence in Vittoriosa sits on the site where the original Conventual Church of the Order had been built. Said to have been completed in 1681, the project had been entrusted to one of Malta’s most inspiring architects Lorenzo Gafa. It is also noted that the original church was not completely replaced but extensively remodelled containing earlier choir stalls in the new design. 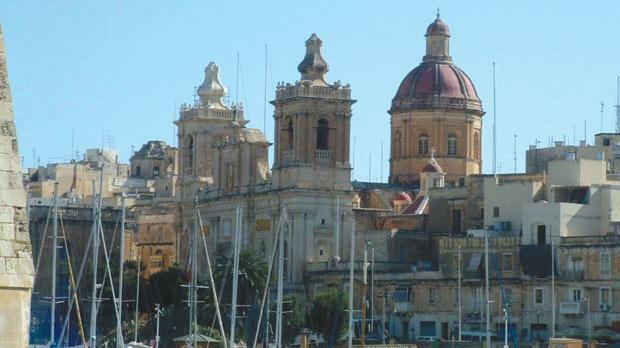 The church of St Lawrence was the first significant parish church to be designed by Gafa, who being a native of Vittoriosa, may have been favoured in securing him the job. The church, raised on a high platform and accessed through a steep flight of steps, is built on a restricted site to a traditional Latin cross plan with a three-bay nave and lateral aisles. Local historians state that Gafa’s design for St Lawrence church probably comprised only the three central bays of the present façade. Furthermore, it is believed that Roman architect Romano Carapecchia was responsible for the later addition of the extra two bays that incorporate the bell towers. They were additions to the façade designed in the early 18th century, although one of the towers was constructed in 1913. Although the church was damaged during WWII by 1953 both the dome and the adjoining chapels on the south side were rebuilt.